You’ll need a number of skills to master content marketing. The most important of them is teaching. The post inspired me to write a “how to teach effectively” article featuring the ideas of two experts on the subject of learning: my daughters. The article details five lessons for earning an A in education. If you fear your content may sometimes lull readers to sleep, check it out. In an effort to explore the topic further, I pecked my way around the web, digging up insights from a variety of experts qualified to opine on the qualities of the best teachers. I wasn’t surprised to find a number of the themes my kids hit on re-emerge—especially humor, interaction, and unpredictability. It’s kind of a lesson within this lesson: Want to know what works best? Ask your audience. You follow me, right? I’m saying if you want to know what makes a great teacher, ask the students. This simple principle applies to your content marketing in the biggest way. Are you in the habit of asking your customers how you can best school them? In my research, I found—and loved—a fairly simple list from Colorado State University titled, “Good Teaching: The Top Ten Requirements.” The list comes from Dr. Richard Leblanc who earned the Seymous Schulich Award for Teaching Excellence. Good teaching is about listening, questioning, being responsive, and remembering that each student and class is different. It’s about eliciting responses and developing the oral communication skills of the quiet students. It’s about pushing students to excel; at the same time, it’s about being human, respecting others, and being professional at all times. There are actually multiple ideas to take away here. And what a great insight this is: Each student and class is different. If you want to excel at content marketing, you have to apply this idea. Have you defined the personas of those you serve? Have you identified how your prospects’ and customers’ needs differ based on time and place—where they are in their buying cycle? The final point above is “pushing students to excel.” Does your content manage to do this? Leblanc says it takes a human touch, respect, and professionalism to successfully inspire students. Great teachers are instructional leaders and curriculum designers. They identify difficult-to-teach and hard-to-learn concepts, and work collaboratively with other teachers to design authentic and meaningful learning experiences that engage students. They are constantly talking and listening to students so they can design work that motivates and inspires students to learn the content at high levels. They focus on student learning as opposed to teaching. Good teaching is about humor. This is very important. It’s about being self-deprecating and not taking yourself too seriously. It’s often about making innocuous jokes, mostly at your own expense, so that the ice breaks and students learn in a more relaxed atmosphere where you, like them, are human with your own share of faults and shortcomings. A great teacher can ‘shift gears’ and is flexible when a lesson isn’t working. This teacher assesses his teaching throughout the lessons and finds new ways to present material to make sure that every student understands the key concepts. I believe the ability to adopt is important in content marketing. Just as a teacher should be ready to depart from his or her agenda, marketers are wise to be flexible, experiment, and react to circumstances as they change. A great teacher creates a sense of community and belonging in the classroom. The mutual respect in this teacher’s classroom provides a supportive, collaborative environment. Each student is aware that he or she is an important, integral part of the group. A great teacher lets students know that they can depend not only on her, but also on the entire class. Every idea above can be applied to your work. Do you think about creating community on your blog? When you speak, are you able to make the audience feel important? Do you collaborate with your community? Just as teacher strives to establish trusting relationships with students, as a marketer, you need to create rapport with your audience to win their loyalty. This may seem obvious, but it’s sometimes overlooked. A great teacher has incredible knowledge of and enthusiasm for the subject matter they are teaching. They are prepared to answer questions and keep the material interesting for the students. Great teachers do what they do because they truly enjoy it. They couldn’t imagine doing anything else.
. It’s about caring for your craft, having a passion for it, and conveying that passion to everyone, most importantly to your students. Great teachers have to have a comprehensive knowledge of the subject matter they are teaching. They have to have good communication skills to get the message across to students. They must demonstrate to students that they care about them. We believe that students don’t care how much you know until they know how much you care. Are passionate about teaching? Do you get excited about influencing the lives of the people who invest their time in your content? If you can’t answer in the affirmative, it’ll show through in your content. 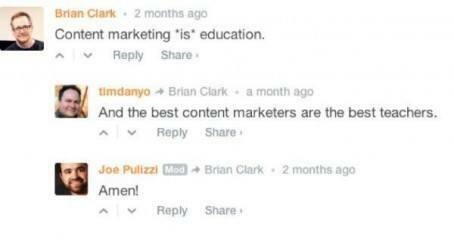 Like the best teachers, top-notch content marketers inspire those they instruct with unbridled passion for discovery and growth. I want to remind you to embrace learning. Experiment with new strategies. Roll new technologies into what you’re doing. Renew yourself daily. You have to be a great teacher to be a great content marketer. And great teachers possess a love of learning.